Youtube is one of the best video sharing websites of the world. You can watch awesome videos, songs, and free movies online all day long on youtube for free. However, over the past few years, people have also started watching and uploading videos on Facebook. Facebook is also having a huge collection of videos which you can watch, share with your friends and enjoy all day long. Most of the videos which are present on Youtube are also available on Facebook nowadays. Now as there are a lot of videos available on Facebook, there are times when you love a certain video and want to download Facebook videos on your android smartphone. Unfortunately, Facebook only allows you to watch the videos and not download them. If you want to download Facebook videos then you can take help of some third party software’s or methods which will help you to download Facebook video easily on your android devices. Today in this Facebook guide, we are going to tell you how to download Facebook videos on Android smartphone and tablet. Whether you want to download facebook videos online or using facebook video downloader app, in both situations these step by step tutorials of downloading facebook videos on android mobile phone and tablet is just perfect for you. We are going to share a total of three methods in our guide today. You can select the one which suits you the best to download facebook videos on android. In order to apply this method and download video from facebook, you must have two things with you. First is the Facebook app installed on your android mobile phone and another one is the Opera Web Browser. Once you are having both the Facebook app and Opera browser installed on your mobile phone you can find out how to download facebook videos on android phone. Step (1): Firstly, open the Facebook app which is installed on your android mobile phone. Step (2): Once you have opened Facebook, open the video which you are willing to download. Once the video is opened, tap on it. Step (3): A dialog box will pop up on the screen which will display some playback options. You will be asked to select between the android stock video player and Opera web browser. Select Opera from here. We suggest you to select the Always option here as it will help you to download facebook videos on android easily in future. Step (4): Now you will see the video opened in Opera browser. As we all know that opera doesn’t support Facebook videos, you will be redirected to a URL which will bring the downloading of the facebook video. It will take around 2 seconds for the video to start downloading. This is how you can use Opera web browser to download video from facebook. If you know any other browser which doesn’t support playback of facebook videos, you can use that too. Step (1): At first, make sure you have installed both the ES File Explorer and Facebook Mobile App on your android device. If you have not installed these apps you can download them from Play store and install them. Step (2): Open the Facebook app and select the video which you want to download. Tap on the video. Step (3): Now complete action using ES File Explorer and the video will be downloaded. Step (4): Once downloading is complete you can open ES File Explorer and view the downloaded video. That’s it! 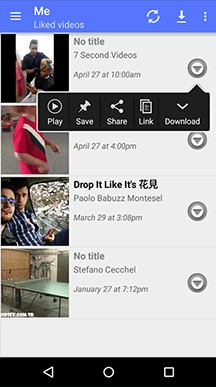 Now start enjoying your favorite Facebook videos on your android devices. If you were not able to download facebook videos using the above two methods you can follow this method. This is the last but one of the easiest methods which will help you to download video from Facebook. Step (1): First of all, you need to download MyVideo Downloader app from Play store. Click on this link to download this app. Step (2): Once you have downloaded this application, install it on your android mobile phone. Authorize the application once it is installed on your android smartphone or tablet. Step (3): Now open this application and you will see all the videos which are uploaded in your account. Along with that, you will also see the videos which are uploaded by your friends. In short all the videos which are present in your Facebook account will be available here. Step (4): Right next to the videos you will see a small check box. Select the check box of the videos which you want to download and tap on the Download button. This will start downloading the videos which you selected. Thus, you can see how simple is to download Facebook videos on android phone or tablet using Facebook video downloader apps. These are the three best and simplest methods which you can follow to download videos from Facebook. If you are using any other simplest method to download Facebook videos on android other than the ones which we have mentioned above or, if you really found this guide “how to download facebook videos on android” helpful for you then please share your view with us via comments and share this guide with your friends on social media sites → Facebook | Twitter | Google Plus.